Czech cellist Frantisek Brikcius was born in Prague, into a family with a distinguished cultural background. He has been playing the cello since early childhood. 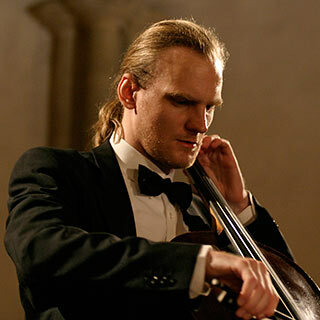 Following his cello studies at the Prague Conservatoire, he completed his Master’s degree at the Janacek Academy of Music (JAMU) in the Czech republic. He furthered his cello skills at the Toho Gakuen Academy in Japan and later under the guidance of legendary cellist Prof. Anna Shuttleworth (student of Pablo Casals) in the United Kingdom (Eton Cello Master Classes and the University of Leeds). Frantisek won the 2nd prizes at the Anglo-Czech Competition in London (1999), the International String Competition London (2000) and the International String Competition Jihlava (2003). He has been awarded many scholarships and fellowships, including the Czech Music Foundation (CHF), the Ministry of Culture of the Czech Republic, the Music Foundation OSA, the Socrates-Erasmus, and the Gideon Klein Foundation for the propagation of works written by Jewish Holocaust Composers. He chose to dedicate his life to the interpretation of cello compositions written by composers of the 17th, 18th, 19th, 20th and 21st centuries, giving special consideration to compositions for solo cello. His favourites are cello suites by Johann Sebastian Bach, Max Reger and Benjamin Britten. He is particularly involved in researching, studying and performing works by Czech (Antonin Dvorak, Leos Janacek, Bohuslav Martinu, Josef Suk and Irena Kosikova), Jewish & Terezin (Gideon Klein, Erwin Schulhoff, Zikmund Schul, Jaromir Weinberger, James Simon and David Popper) and contemporary composers (Conrad Beck, Luciano Berio, Pierre Boulez, Benjamin Britten, Henri Dutilleux, Wolfgang Fortner, Alberto Ginastera, Cristobal Halffter, Hans Werner Henze, Heinz Holliger, Klaus Huber and Witold Lutoslawski), playing on a “George Kriwalski” cello made in 1904. Together with his sister Anna Brikciusova, he is a founder member of the “Duo Brikcius”. He is artistic director of the Festival Brikcius – Chamber Music Concert Series in Prague (since 2012) and the Bach Festival Gers in France (since 2016). Frantisek works as independent film-maker as well. His first music documentary film MAKANNA (in the cooperation with the Jewish Museum in Prague and under the auspices of Sir Tom Stoppard and Vaclav Havel) was already screened in the Czech Republic, China, Mexico and Portugal. Recently he is working on new music documentary film eSACHERe (2018). As a soloist Frantisek has performed at many festivals in Algeria, Austria, Belgium, Bosnia and Herzegovina, Bulgaria, the Czech Republic, France, Germany, Israel, Italy, Japan, Poland, Russia, Slovakia, Sweden, Turkey and the United Kingdom. Frantisek has been teaching cello for many years. More information about František Brikcius and his projects Prague – Brno: 6 Contemporary Composers for Cello Solo is available on websites www.Brikcius.com and/or Festival.Brikcius.com .